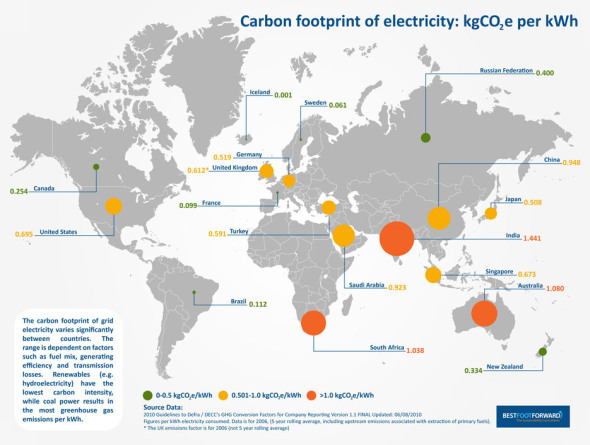 A great infographic about the carbon intensity of electricity from around the world by UK consultancy Best Foot Forward. It doesn’t have every country detailed but it does show how bad Australia is compared to the rest of the developed world when it comes to the carbon intensity of our electricity generation. We sit at just over 1kg CO2/kWh of electricity generated – only India in the BRIC economies is worse than us – Brazil 0.12, Russia is 0.4, India 1.44 and China 0.95. What makes it worse is China has a renewable energy investment strategy and emission reduction targets way beyond ours. The developed nations put us to equal shame – France is 0.1kgCO2/kWh (90% less that Australia), the US is 0.7, UK 0.61 and Canada 0.25. With the carbon intensity of electricity generation being so bad in Australia its no wonder that installing an individual isolated trigeneration system using natural gas stacks up so well when it comes to emission reduction in building design. But is trigeneration a long term solution to decarbonising the built environment? Is this really what green building design should be about? Are we getting full benefit from this alternative power generation? Yes, our carbon intensity is terrible compared to many countries but many of those you mentioned use Nuclear Power which has very low carbon intensity. This is an obvious solution to the problem but how do we feel about Nuclear?? Personally, i am not in favour of it in my backyard! Thanks for the comment Simone. I think nuclear is inevitable at some point in the future, purely as.you say for its carbon benefits. The thought of nuclear disasters riddle me with fear but so does global warming. The godfather of Gaia Hypothesis, James Lovelock is a recent nuclear convert. So don’t know, I’m on the fence at the moment.